I feel a number of things about Quinn’s injury, and I’m not quite sure how to sort them all out. I thought maybe blogging about them would help me figure out my feelings. 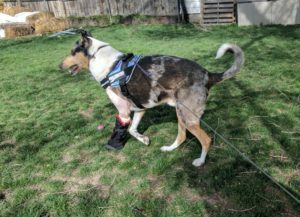 Because Quinn, well, being a dog, he lives in the present moment, and he’s dealing with his injury and cast as dogs do, dealing with how he feels Right Now. He’s not dreading that he won’t be able to do agility… maybe ever. He’s not thinking that he’s stuck in his x-pen and cast for months. He’s not dreading his lack of activity. So these things I think are good, even while at the same time I know that he wants to play and I know how much he enjoys the sports. First of all, I’m concerned about Quinn’s health. And, for the rest of his life, he will now lack health in his left front ankle. 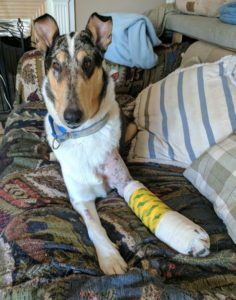 He had to undergo a full arthrodesis of his left carpus, which means his wrist bones were fused together and his wrist will no longer bend. His tendon was destroyed and can no longer support his wrist, so the fused bones will do that instead. How is a person supposed to feel about something like this? Ultimately, this is my fault. I asked Quinn to compete in agility. I trained him to perform the teeter, and while I thought I had trained him properly, he had an accident anyway and he didn’t control the tip of the teeter and it went down before his feet did, he slipped off, and landed on his wrist, fracturing the bone and effectively destroying his carpal tendon. I feel guilt. I feel sadness. I feel anger. I also feel disappointment and I may, depending on how he recovers, end up mourning some of our performance career. There was a recent post on The Cognitive Canine that I thought was appropriate for my particular situation. It’s called Tennis Racquets and Doubles Partners. She talks about how some handlers think of their dogs as the Tennis Racket needed to perform their sport. And other handlers think of their dogs as partners in their sport. I agree that there are a lot of people on both sides of this. Myself, my dogs are my partners. First and foremost they are my friends and my companions. And next, they are my agility dogs. So is it acceptable to feel, in addition to guilt and sadness about Quinn being injured because he’s my companion, also feel disappointment that we may no longer compete in physically active sports? I’m sure he’ll be able to continue with Nosework and Barn Hunt, and probably even the limited jumping that Obedience requires, but what about agility and herding? I don’t know. I’m rather a pessimist at heart, and my knee-jerk reaction is that he won’t be able to do these things anymore. And that saddens me too. I enjoy doing agility with my dogs. It’s always been my cornerstone dog sport. It was my first dog sport, and I still enjoy it. So as I write this out, I think yes, it’s probably just fine that I not only am saddened and heartbroken about Quinn being hurt, I’m also saddened and heartbroken that we may never be able to do agility again. Of course, I’m told to wait and see. But how can a dog jump reliably without being able to bend his wrist? Reading Dr. Google… it seems like many dogs actually can return to jumping after full arthrodesis. But is that something I want to ask Quinn to do? Do I want to have him perform the teeter again? Am I going to proof the teeter for my other dogs more, so they understand it will move out from under them? That last one I have an answer to. You bet I am. One of my good friends and I are always commiserating about how impatient we are, and we wish we could have a Future Glimpse just to see what is going to happen in the future. I could use one of those now. 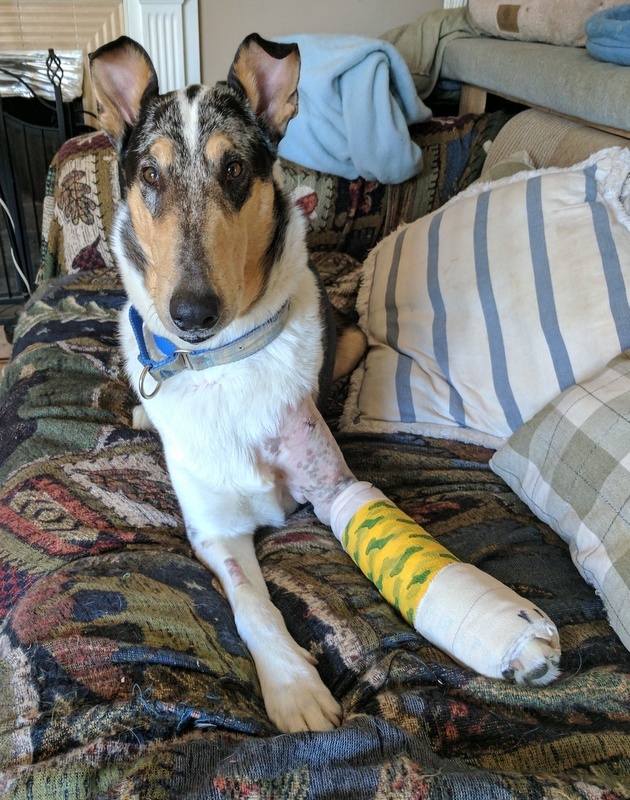 Just to know if he will be able to jump and herd again or not. Then I could just get over wondering about it and deal with it now. So for now, I will concentrate on Quinn’s recovery. His comfort level for today. I want him to be as happy as he can be, even wearing this cast that I put him in. He gets bully sticks and little play sessions. I’m going to clicker train him to do some fun little things like a lip lick. 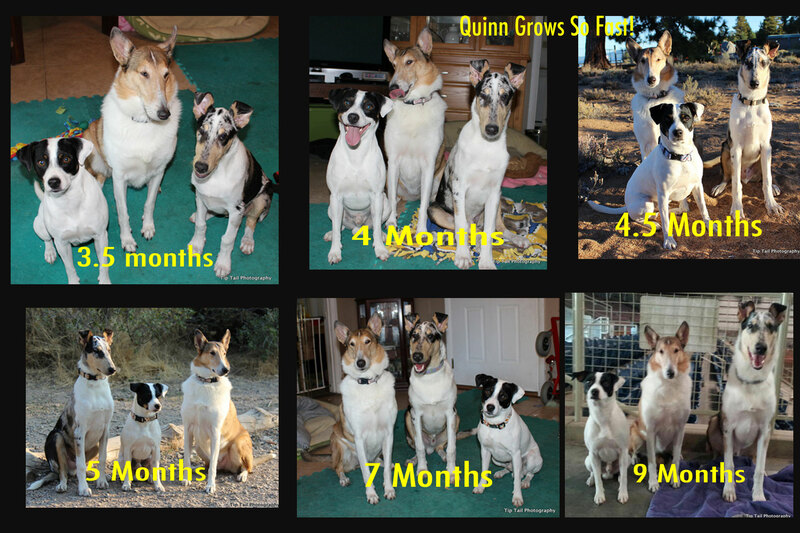 I have such a great dog community that provides Quinn and myself wonderful support. And I’ll work on paying off the cost of his surgery, that was upwards of $3,500. And yes, I’m also frustrated that this injury cost so much money, because I don’t that kind of money just laying around. And I’d sure rather spend it on dog show entries! That was the most expensive agility trial I’ve ever been to. Ahhh the mistake of training too long. It’s so easy to do. At least for us humans. The dogs can tell us, though, when they are done. Maze is super good at letting me know! I worked him too long today. This is the good parts of his game today of pushing stuff around in the pan. At the end (the part I’m not showing) he left me and wandered off, he was done! Since I want him to like things that move and bang, I thought maybe it would be a good idea to pile up some boxes and have them push them over. Eventually I can change it up to pieces of wood and metal, so he makes more noise. So this video shows him pushing the box out of the way to get to his cookies. I think he did a good job! I also worked Maze’s cart a little bit… but, because yesterday it moved in a scary way, he didn’t want to get on the cart today. Oh no… so I have some fixing to do. I want to build him up, not take a step back! However, I’m human, and unfortunately will probably make mistakes along the way. And here are some short videos of training Jet and Quinn to close the door. 🙂 I want to build on this game and make it fun! Author CynthiaPosted on 21 March, 2016 Categories Jet, Maze, Quinn, TrainingTags Jet, Maze, Quinn, TrainingLeave a comment on Don’t Work Too Long! Oh boy… puppies just grow up so fast! I put together a little collage of the pictures I’ve taken over the last months. I had some fun pictures like this of my guide dog for the blind puppy, Greta, waaaay back in the 90s. As she grew I took pictures of her next to Kip, my Shepherd mix. So I thought it’d be fun to do the same with Quinn. So here’s the three (the BCs are not included since they do more with their Dad than with me). These are of Tatum, Jet and Quinn. Quinn just grew so fast!